Just in time for the Holiday giving season, HB has received a challenge grant. Every donation made before December 31st will be matched, dollar for dollar, up to $2,500! Now is YOUR chance to help raise much needed funds to continue Hekab Be's homework help, art lessons, math and English tutoring, recreational activities/physical education, health monitoring, and family enrichment. To participate in this challenge, simply click on the DONATE button on the right side of this page. Hekab Be is a U.S. non-profit, so your donations are tax deductible!! Many of you bring supplies to share for our many projects throughout the year and clothing for our local yard sales, and these items are greatly appreciated. As Hekab Be receives no government funding or assistance of any kind, we also rely on your monetary donations to pay for our very modest staff salaries, their expert programming, our water and electric bills, and the building and grounds maintenance. 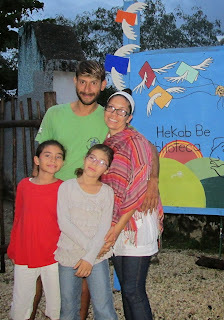 In January of 2013 Israel, Gimena, & their 3 children moved to Akumal from Central Mexico. Within a few months of arriving, Gimena started volunteering with the children of Hekab Be to teach them yoga at the Yoga en Akumal Studio. The daughters, Katerina and Roberta, attend Hekab Be most afternoons for the after school programs, as Gimena considers them excellent enrichment to her home schooling. Gimena and Israel cook and clean for every event at the library, and within the past month have been teaching free English classes for adults at Hekab Be offered through a government program. Even though the program’s funding will end in another week, Israel and Gimena have decided to continue giving the classes without getting paid, since their students have made such progress and are so grateful for the opportunity. This family is a true example of what Hekab Be Biblioteca represents --- a place for families and community, welcoming to all. We'd like to say THANK YOU to everyone who has supported HB during this past year. In whatever form you shared your generosity with us, we are extremely appreciative of your support; without you there wouldn't be a library! We are wishing you all the best during this Holiday season, and in the year to come.